CompTIA Security+ Certification certifies the competency of security professionals working in the IT industry. The theft or destruction of information or the disruption of communication resources can result in not only lost time and revenue, but also an irreparable loss of confidence by clients and customers. The ability of computer networks to remain functional continuously for only their intended users has been a necessity to business. Professionals who have Security+ training, who have demonstrated the ability to respond to human and organizational weaknesses by passing Security+ tests, and who have had instruction in cryptography, communication security, can use real-world tools, understand the infrastructure, and haven?t just studied Security+ brain dumps will demand the respect of the IT industry. Your success in our Security+ training and investigation of our Security+ study guide will result in not only passing Security+ tests, but also success against those who would steal, destroy, or disable your business. Start your certification training today! CompTIA Security+ Certification certifies the competency of security professionals working in the IT industry. The theft or destruction of information or the disruption of communication resources can result in not only lost time and revenue, but also an irreparable loss of confidence by clients and customers. The ability of computer networks to remain functional continuously for only their intended users has been a necessity to business. Professionals who have Security+ training have demonstrated the ability to respond to human and organizational weaknesses by passing Security+ tests, and who have had instruction in cryptography, communication security, can use real-world tools, understand the infrastructure, and haven't just studied Security+ brain dumps will demand the respect of the IT industry. Your success in our Security+ training and investigation of our Security+ study guide will result in not only passing Security+ tests, but also success against those who would steal, destroy, or disable your business. Start your certification training today! Study with our our instructor led classroom training at your convenience and never misses another lecture or fall behind. You are in complete control. We invited the best CompTIA Security+ Certified Trainers in the industry to help us develop the ultimate training and certification program which includes everything you will need to fully prepare for and pass your certification exams. 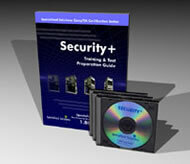 Geared for IT professionals wanting to specialise in information security as IT security officers. Also: network administrators, firewall administrators, system administrators and application developers. £191 +VAT (each). 1 Exams required.